I’d say somewhere around…today I recovered from my trip to Los Angeles where I was reunited with Sheldon, Simon, and Andy. You see, I was out there to cover E3 2009 for a video game website I write for and while I’ve always dreamed of attending E3, it was exhausting. However, it wasn’t so exhausting that I don’t have a funny story for our loyal Comic Impact readers. So here we go. On Day 2 of E3 I had about 2 hours of time to kill in between appointments to roam the show floor and get to check stuff out that I wasn’t scheduled to see. Being the comic book addict that I am, the first things I headed to were Batman: Arkham Asylum and DC Universe Online. Now, if you aren’t that familiar with video games let me just tell you that DC has a lot riding on these two games. They want to be a force in the gaming world like Marvel has been with their best-selling games published by Activision (X-Men Legends, Marvel Ultimate Alliance, X-Men Origins: Wolverine, etc.). Mortal Kombat vs. DC Universe was a pretty big success, but I have to think some of that was just people buying it because it’s such a bizarre concept. That, or they wanted to do every fatality possible on Superman. But I digress. So I go up to the DCU Online booth and just hop right into a fight. I was apparently on the “good guys” team because my objectives were to assist Superman and Green Lantern and also to defeat Lex Luthor and Sinestro. So I’m playing away having a good time. My hero had some sort of lightning spear and would do all kinds of fun moves with it. The game was set up for PvP, so I was just beating down this one other player who couldn’t really seem to do much about it. There were six computers set up in total and to my left was a developer wearing a cowboy hat showing the game off to a group of about five people. It’s hard to play games like this when there are so many people around and you are just tossed into the game without any real way of knowing how to achieve your goal. So, as I continue playing and killing this other player, and chasing Sinestro around, a voice beside me shouts, “Hey! Stop!” Completely alarmed I look to my left and the developer and all five people he was showing the game to are looking at me- the developer with a very pissed off look on his face. “Dude, stop it,” he continued. At this point I mini-panicked. Had I been playing too long? I had totally lost track of time, were people waiting to play and I was being “that guy” whoring up the machine? Had I discovered an exploit in the game unknowingly and was screwing it up for everyone else as I was playing? I felt like a JERK without even knowing what I had done, but as everyone just glared at me, I assumed it was something bad. Then all of a sudden, the dev let’s a big laugh out and smiles, “You’re making me look bad in front of these guys!” OH! It finally clicked that the guy I had been incessantly pounding on over and over, was the developer demoing the game to people. “Ha, oh, right sorry man,” I said. “Nah, it’s alright, I’m just messin’ with ya,” he said, and with that we went back to playing the game. 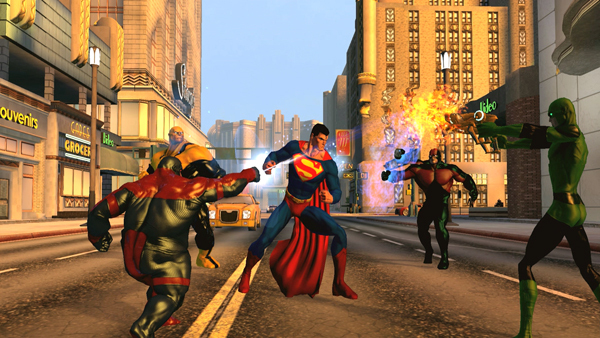 As far as gameplay goes, I’m a little concerned for DCU Online. I want it to be good. It’s the first major MMO to be on a console AND be targeted to everyone (don’t you dare email me about Final Fantasy XI). I’ve played ever major MMO so I know what’s good and what isn’t, and what I played of DCU Online just wasn’t good. I had no idea how much damage I was doing with my attacks, there were only four attacks to even choose from, only four buffs which also had no explanation of what they did, and there just seemed to be a lack of structure and purpose in the game. Now, granted MMO’s are probably the worst games to demo at conventions, but I spent a pretty good amount of time with it and there was just something very off about the whole experience. On a positive note, I can tell you that the game looks better than any MMO that’s ever been released. Yeah, no kidding Jim Lee was involved in the art design because damn, the characters, scenery, and powers were all top notch. I expect that to be the focus of the games marketing as the game inches closer and closer towards release; awesome shots of heroes battling in cool locales. In closing I’ll say that I will still play DCU Online when it comes out, but my bar is now very low and I would expect another delay to be announced because the game doesn’t feel anywhere near ready.